Heat a grill pan over medium high heat and spray with olive oil. Grill the corn, turning occasionally, until cooked and charred in some places, 8-10 minutes. Remove from grill and cool. Cut the kernels from the cobs (you should have about 2 ½ cups). Reserve. Whisk the cornmeal, flour, baking powder, chili powder, garlic powder, and salt together in a large bowl. Whisk the egg and milk together in a small bowl. Pour the wet ingredients into the dry ingredients and stir to combine. Stir in the chives, 2 cups of corn, 2 teaspoons lime juice and ¾ cup queso fresco. Mix the remaining ½ cup corn, ¼ cup queso fresco, 1 teaspoon lime juice, and a pinch of salt together in a small bowl to use as the topping. Heat a cast iron or nonstick skillet over medium heat and spray or brush with about 1 teaspoon of olive oil. Place 8 spoonfuls of the batter into the pan, about 1 tablespoon each, flattening them slightly. Cook 3-4 minutes until golden brown, then flip and cook another 2-3 minutes. Remove from the skillet. Working in batches, heat the remaining oil and cook the remaining fritters (you should have about 32 fritters in total). To make the cilantro lime yogurt, stir the yogurt, lime juice and cilantro together in a small bowl. Drizzle some cilantro lime yogurt on top of the yogurt. 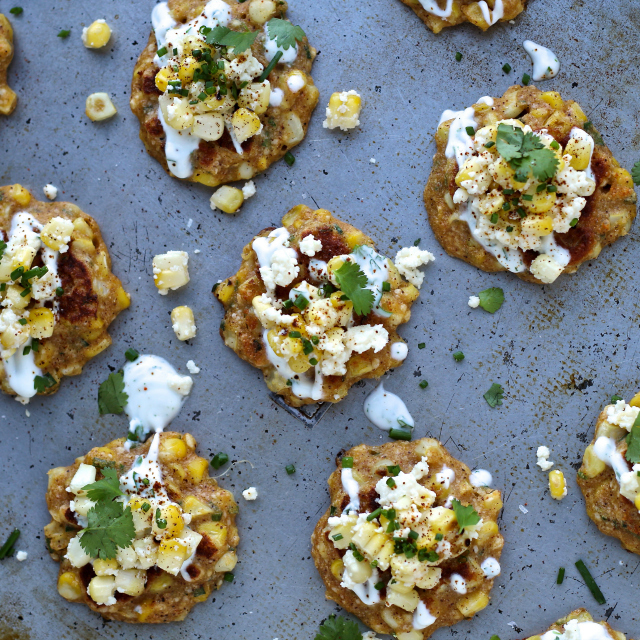 Place a small amount of the corn and cheese topping on top of each one and garnish with extra chives and cilantro.